Leek and mustard stuffed chicken thighs and a new kitchen. I may have mentioned in the last post or two that we are about to embark on a new kitchen refurbishment. This has led me to trawl through my archives of dishes that I hadn’t blogged about. This gorgeous looking dish got my eye. 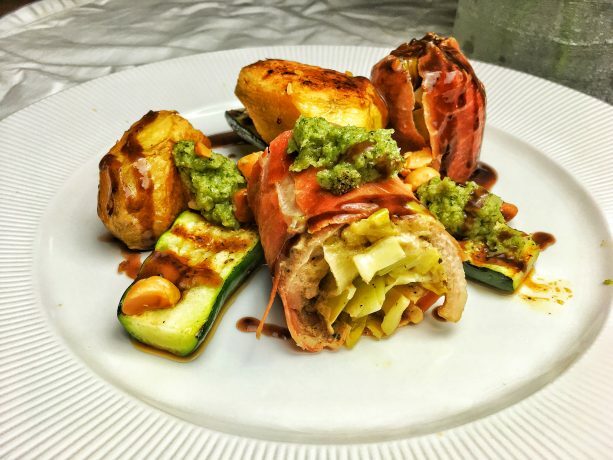 Not only does it look great, it obviously tasted amazing with the leek and pine nut filling, a fresh sage and onion stuffing, griddled courgettes and fondant potatoes. Ultimately it cost very little to make too. Always a bargain in the world of ever increasing food prices. If you can get organic or your chicken from a butcher it will make so much difference to the end product. The kitchen, well its a little more than a kitchen refit. The back wall is coming out and being replaced by a wall of sliding glass. New underfloor heating and tiles, plus a new utility room. Amazingly, you can sell your old kitchen on ebay these days! Who knew? If nothing else it saves a couple of skips. Old kitchen ready for a new home. I’ll keep you updated with developments as and when. Back to cooking. To make the chicken thigh rolls, soften the leek in a touch of oil with a little salt. Toast the pine nuts in a dry pan. Take half of the leeks and puree them. Then stir together with the remaining leeks and 75% of the pine nuts. Bash the chicken thighs into rectangles which are the same thickness. Lay on a piece of parma ham, brush the thigh with mustard. Add a spoonful of the leek mix and roll up. To make the stuffing, soften the onion and garlic in the butter for 10 minutes. Turn up the heat and add the sage, cook for 1 minute. Add this mix and the breadcrumbs to a blender and puree. Place in an oven proof dish and bake for 20 minutes at 180°C when ready. Griddle the courgettes for a few minutes a side, seasoning with salt and pepper. To cook the thighs, roll tightly in foil. Cook in a pan in the foil turning every 2 minutes. Finish off in the oven for 5 minutes. Rest for 5 minutes, before removing the foil and slicing each thigh into two. Serve with potatoes and a drizzle of sauce. Ooh, I love a good before and after when it comes to interiors. Good luck with it fdathome. This plate of food looks delicious. It even looks like something a novice like me could attempt! Its easy Neela, anyone could make it. The chicken looks fantastic!!! 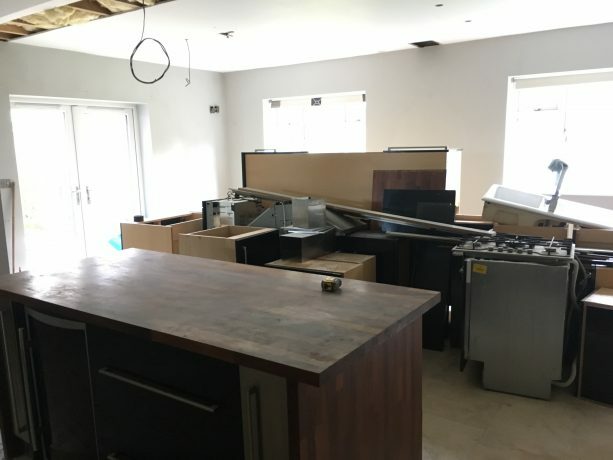 The kitchen….. not so much. It will, it will. Or so I keep telling myself. This is an outstanding recipe but we’re all eager for the new kitchen. Probably not as eager as you and the Missus! I’d heard you could sell a kitchen on Ebay and I thought the same thing. Let someone else take it apart and move it. It was such an easy process, Maureen. 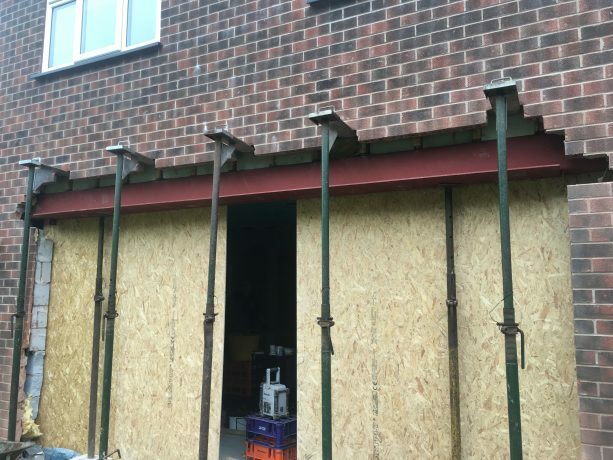 The guy who bought does a lot of home development. He hired a great big van, drove 200 miles to pick it up, and then drove back. Simples. Love using chicken thighs as so much more taste. You’ve definitely transformed it into something special! Good luck with the kitchen; I still have sweet and sour memories of mine! Worth it in the end though. I can’t wait to see your new kitchen. This chicken dish has some amazing flavors going on and I’m a big sage fan. That is pretty cool, can’t wait to see the wall of windows! Love heated floors. We donated our old kitchen to Habitat for Humanity and they gave us a healthy tax receipt we used as a deduction on our income, pretty sweet too! They sent a dozen or so volunteers to dismantle the kitchen and remove it, we just stood by and watched! They even took the appliances and the old window! Where was this post last Thursday when I was killing myself trying to remember what Brits called zucchini at a charity trivia night! Darn! This dish looks absolutely delicious Dave, such fresh, spring flavours. I don’t often buy chicken legs but I know how succulent they can be. I wish you well on your big reno!